"I tinkered a bit with what I found in other recipes and this is the result. I think I like my results. I stirred in a small handful of tamari-flavored pumpkin seeds just before serving (couldn't find plain ones) and sprinkled a bit of paprika on top to make it look nice." 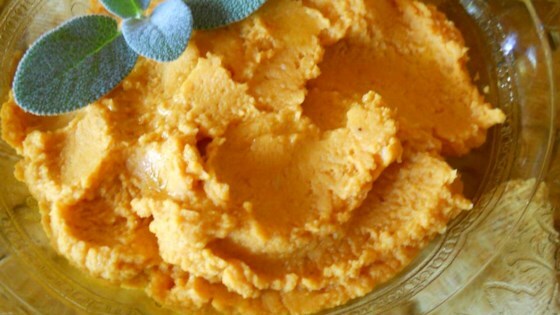 A traditional hummus mixed with pumpkin puree, cinnamon, nutmeg, and allspice. I added 2 teaspoons extra olive oil and instead of blending the pumpkin seeds into the hummus, I toasted them and placed them on top with chopped dried cranberries. Soooo gooood!!!!! !